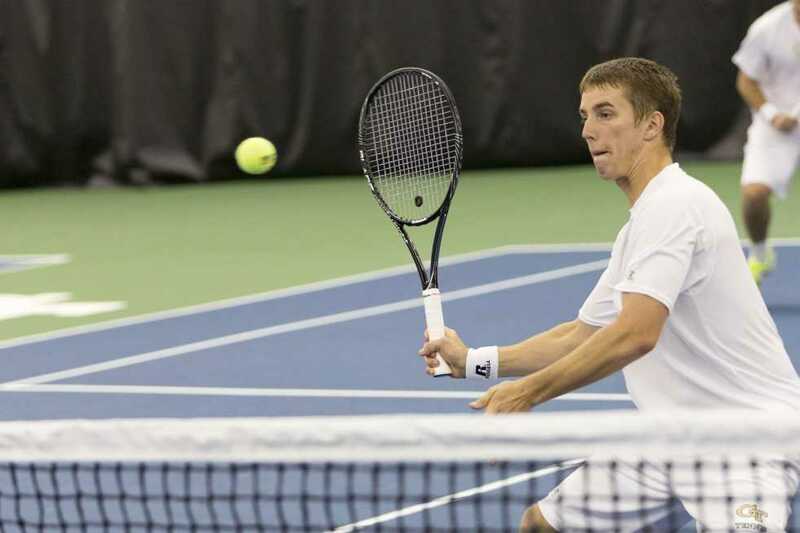 On March 28, the Tech men’s tennis team traveled up north to take on Boston College. After having lost four straight conference matches, including three close 4-3 losses, Tech defeated Boston College 6-1. With the win Tech improved to 8-10 (1-4 ACC), while Boston College fell to 5-8 (0-3 ACC). Tech picked up the first win of the day when freshman Nathan Rakitt teamed up with senior Juan Melian to defeat Boston College’s Billy Grokenberger and Matt Wagner 8-6 at line two doubles. The Eagles won the second match of the day when Phillip Nelson and Michael McGinnis defeated senior Juan Spir and sophomore Eduardo Segura 8-6 at line one singles. The doubles point would come down to line three doubles where Tech’s freshman Garrett Gordon would team up with sophomore Colin Edwards to defeat Kyle Childree and Alexander Thirouin 8-6 and put Tech up 1-0. The first singles match to finish was at the three spot where Tech’s Nathan Rakitt defeated Jonathan Raude 6-1, 6-2. Line five singles was the next to finish as Smyrna, Ga. native Kyle Childree of Boston College defeated Tech’s Garrett Gordon 6-2, 6-1. Eduardo Segura defeated Billy Grokenberger 6-2, 6-3 at the four spot to give Tech their third point of the day. Tech got their fourth point and clinched the match when Juan Spir defeated Michael McGinnis 7-5, 6-3. Although the overall winner between Tech and Boston College had already been decided, there were still two close matches left to finish. At one singles, Tech’s Juan Melian would defeat Phillip Nelson of Boston College in a close three set match 6-3, 3-6, 6-2. The win would be Melian’s third straight victory and his twentieth of the season, which ties him with Nathan Rakitt for a team high in singles win. The last match of the day to finish was at six singles between Tech’s Colin Edwards and Boston College’s Matt Wagner. Edwards won the first set 6-4, and then won the second set in a tie-breaker with a score of 7- 6 (14-12). The men’s tennis team will be back on the court tonight as they look to get their second consecutive win when they host the University of North Carolina tar Heels at Ken Byers Tennis Complex at 4 p.m.
North Carolina is 7-10 overall and will come to Atlanta in attempt to pick up their first conference victory after dropping their first four conference matches of the season. Although the team is struggling, UNC’s one singles, Esben Hess-Olesen, has had a great season. He is 18-8 with six wins over ranked players.